Come celebrate Mardi Gras in downtown Montgomery with a cruise on the Alabama River. Ticket includes two hour cruise, live entertainment, concessions and cash bar. 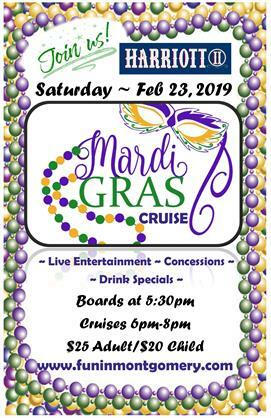 Wear your Mardi Gras colors and beads and join the Harriott II staff and crew on this one of a kind adventure. Don't Miss the Boat! Call 625-2100 for more information.